Children do not simply grow, but evolve from nature into culture; therefore ecology should form the basis of design for both indoor and outdoor spaces in early child education centers. Through interaction with the natural environment, children become active participants in their own development. One key benefit of this interplay of biology and experience is a child’s improved ability to self-regulate. Self-regulation emerges from experiences of vulnerability and resilience which are, in part, associated with exposure to nature. The fundamental realization of the need for ecologically-integrated early childhood centers lies in the fact that children are receiving less and less opportunities to interact with flora and fauna, particularly in the early development stages of their lives. Unfortunately outdoor play is a declining trend in the United States and therefore decreasing our young population’s exposure to ecology. One study shows that children ages six months to six years spend approximately 1.5 hours a day with electronic media, and childhood obesity has moved up the ranks to become a top concern among medical professionals. These factors have been identified as inhibitors to the amount of physical activity children achieve through play. 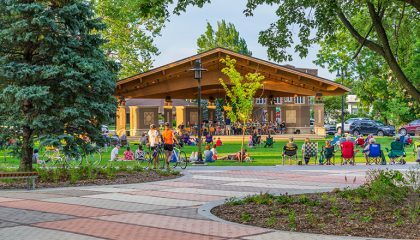 Many educators are looking to provide more engaging and interactive environments outdoors as a counter to this growing trend. Adding natural play elements that increase ecosystem diversity is one way to make playscapes more attractive to children and parents alike. Research has shown children will play longer in playscapes designed to mimic natural systems as compared to play structures fabricated with man-made materials. While additional knowledge and expertise is required to construct and prepare natural play elements, these playscapes can be designed with the same safety and accessibility achieved in fabricated play equipment. Natural play elements not only entertain, but also teach children about the ecology of their surrounding region from which the materials were gathered. A natural playscape is loosely defined as a safe and accessible play area constructed using natural materials; avoiding plastics, metals, concrete, lumber, and signage instructing how to play. Elements of natural playscapes are selected and designed to engage children in ecological learning. Common examples of such elements are rolling hills, log benches, large boulders, sand/dirt, and native and adaptive plantings. These elements are combined to create areas for discovery such as catching the wind, interaction with rainwater, and climbing. 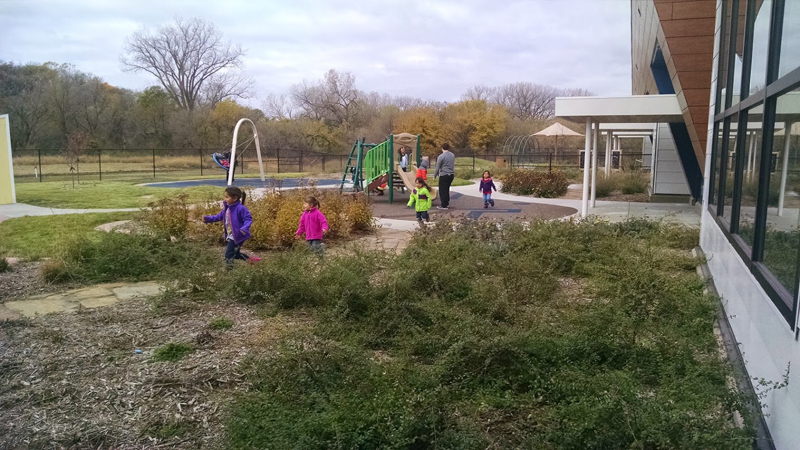 Native and adaptive plantings can be easily incorporated in most playscapes. Depending on the intended outcome of a particular playscape, plantings can be chosen to teach children about different colors or to attract butterflies and hummingbirds, both of which can be a way for children to learn about ecological cycles. From a practical perspective, native and adaptive plantings require less watering and chemicals to flourish than traditional and non-native landscape plantings which can in turn create a safer environment for children. However, within the first few years of planting, native and adaptive plantings typically require more maintenance than simple turf and shrubs. After this initial establishment period however, the native and adaptive plantings require only yearly pruning and minimal watering during drought periods. The necessary tasks for maintenance are different than that of mowing turf – the maintenance of native and adaptive plants requires weekly to monthly weeding instead of weekly mowing. Landscape architects and horticulturalists are trained to identify and locate appropriate plants for children’s play areas. With careful integration, outdoor environments can become engaging and creative landscapes for child development. Opportunities to incorporate ecology are not limited to the outdoors. With indoor environments, many fail to realize the potential for ecological development within the constraints of their roof and walls. The key to remember is that people are components of the immediate ecosystem that surrounds them, whether indoors or out. Biology makes its presence known indoors by way of air, sunlight, mold, and insects. All of these methods may go hand-in-hand with sustainable design choices that many don’t realize can be about more than just energy efficiency. 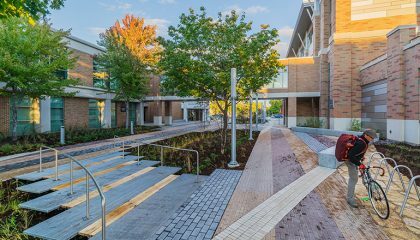 Sustainable design seeks to develop closed-loop cycles for water, materials, and carbon within the smaller ecosystem of a single building and its surrounding grounds. The building industry today has the ability to make education centers sustainable to ensure they meet the needs of the present without compromising the resources of our children’s generation. 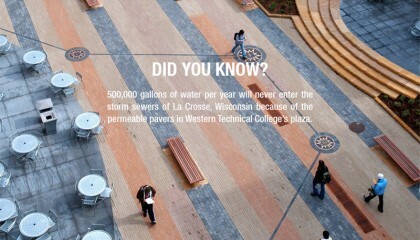 All building users can benefit from ecological design. As adults, it seems likely that our creativity is contingent on our ability to remain in touch with the natural genius of childhood, yet that genius springs from ecology. For this reason, early childhood centers uniquely present an opportunity to demonstrate the value of diminishing the barriers between indoors and out. Healthy air and daylight are two key resources that bring ecological benefits to indoor spaces. While there are few studies in early childhood environments, research in K-12 schools presents strong evidence linking student performance to indoor environmental quality. Current best practices in K-12 design are to provide maximum ventilation rates and follow prescriptive rules for maximizing natural daylighting. One example feature allows teachers the ability to control daylight in their classrooms. 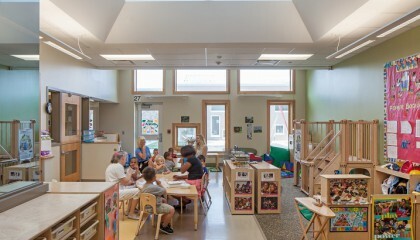 Operable windows allow children interaction with sunlight and ventilation, fostering hands-on teaching/learning experiences that might include manipulation of a cool wind gust or warm light reflection. Connection to the world beyond the building is typically accomplished through doors and windows. Spaces programmed for early learning require access to at least one exterior wall, however the best practice takes that a step further by including access to an exterior door. 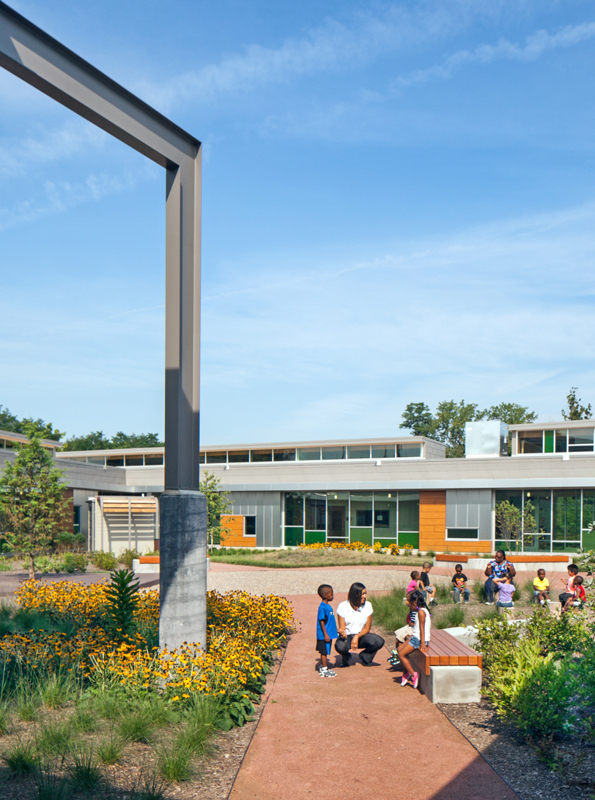 This outdoor connection fosters learning with minimal interruption by the filter that is the building envelope. In addition, providing access to light and air, window and door openings allow views beyond the classroom which encourage an imaginative landscape. Providing a covered area directly adjacent to an exterior door provides play opportunities during inclement weather while also helping to blur the line between indoor and outdoor spaces. Where doors have functional requirements that limit variations, windows are available in a variety of styles that can help to incorporate a diverse perspective in the child’s realm. Windows can be installed at different heights, as well as the incorporation of viewing platforms. They can also be a wide range of sizes and shapes with a variety of translucency and color options. Introducing a variation of windows can help to mimic and reinforce the child’s experience with nature. 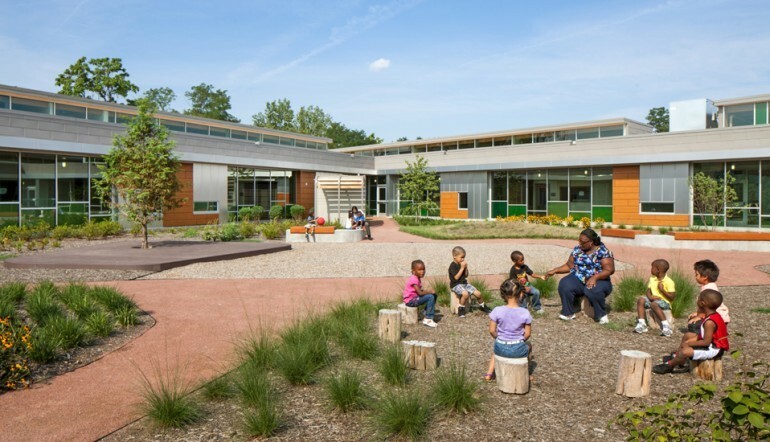 For early learning environments, embracing nature as the basis for design can be especially rewarding. The best spaces are designed to incorporate elements that function to create experiences that mimic those found in the natural environment. Incorporating an array of physical elements increases opportunities for learning and play. Whether indoors or out, there is a strong relationship between the variety of structures available in a child’s landscape and the resultant variety of play observed. Diversifying use of pattern and shape can add interest to elements that would otherwise go unnoticed. The recent advent of research-based early childhood centers invites with it a fresh opportunity to identify and pursue best practices in ecological building design both indoors and out. In understanding the ecological connection to child development, designers need to continually stay abreast of new products and features that can help to provide more opportunities for children to connect to the natural environment, and therefore help to give educators the best possible platform to assist in the healthy development of our youngest generation. Cobb, Edith. The Ecology of Imagination in Childhood. Putnam, CT: Spring Publications, Inc, 2004. Print. Fjortoft, Ingunn. “The Natural Environment as a Playground for Children: The Impact of Outdoor Play Activities in Pre-Primary School Children.” Early Childhood Education Journal. 29.2 (2001): Print. Kellert, Stephen R., Judith Heerwagen, and Martin Mador.. Biophilic Design: The Theory, Science and Practice of Bringing Buildings to Life. Hoboken, New Jersey: Wiley, 2008. Print. Mendell, Mark J., and Garvin A. Heath. “Do Indoor Environments in Schools Influence Student Performance? A Review of the Literature.” Lawrence Berkeley National Laboratory,, 24 Nov. 2004. Web. 11 April 2012. Shonkoff, Jack P., and Deborah Phillips. From Neurons to Neighborhoods: The Science of Early Childhood Development. Washington, D.C.: National Academy Press, 2000. Print. Wilson, Ruth A. “Starting Early: Environmental Education during the Early Childhood Years.” (1996). ERIC Digest. Web. 11 April 2012.
be certainly right. Excellent job with this site.